IN-vision is pleased to announce the purchase of an EyeLink 1000 Plus, a new, sensitive and sophisticated eye tracking device, used by Universities and Hospitals worldwide to study normal and pathological eye movements. 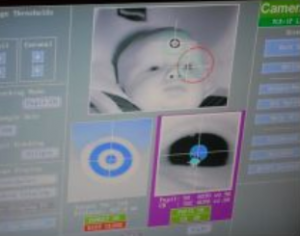 This eye-tracker is one of the first of its kind to be used in the UK and Professor Chris Harris of the Plymouth Royal Eye Infirmary will use the equipment to set up a dedicated paediatric eye movement clinic to continue furthering research into nystagmus. The EyeLink 1000 Plus is an ideal tool for nystagmus research because its state of the art features can capture eye movement simultaneously and reveal detail quickly – all without the need for patients to be stationary for long periods. It’s unique high speed allows for precise quantification of different types of waveforms, and maximises the potential to detect small changes in eye movements that may occur over time. 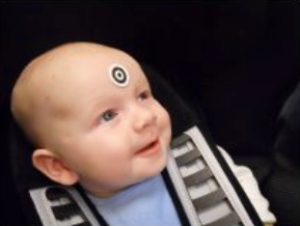 A target sticker is used which the camera can track as well as the eyes, meaning the subject is free to move about, making it a less stressful experience for young ones. One of the reasons the Eyelink 1000 Plus was chosen was because not only can it be used in ‘head-fixed’ mode, it can also be used without stabilising the head. This, and it’s ability to track both eyes simultaneously, thus reducing the time required to obtain a full assessment, and it’s speedy data capture, make it ideal for use on infants and young children. Liz Charter, co-founder of IN-vision believes that early diagnosis and referral from GPs is key to the success for improved treatment of nystagmus. She said: “we are very proud to have raised over £22,000 to purchase this very special piece of equipment for Professor Harris. We are extremely grateful to all of those who helped and especially the Robinson family and Tim’s Fund. Work starts now on raising funds for the next tracker so we can place these around the country. Tim’s Fund was set up in memory of Tim Robinson, supporting children with special needs achieve their potential.